Margaret Rader and Pete Holm have embraced a family tradition of stewardship on their farm in southwestern Thurston County, in the Puget Trough ecoregion of Washington. They were raised on Holm Farm when their parents ran it as a dairy. Their grandparents bought the land—nearly 100 acres bounded by an ox-bow of the Black River—in the 1920s. This brother and sister, together with Margaret’s husband Keith, now manage the farm for hay production, pasturage, and wildlife habitat. Pete and Margaret value the wildlife on the farm, much of which depends on the health of the free-flowing Black River. River otters, muskrats, and beaver ply the waters, and secretive mink lurk among trees and shadows. A gravel bar nearby is a spawning area for salmon. Kingfishers dive bomb the water, great blue herons stand poised to strike, and colorful wood ducks brighten the river as they forage and squabble. Other birds are also plentiful. As Shelley Kirk Rudeen wrote in her article for the Capitol Land Trust News, "‘We also have a big population of raptors,’ says Pete, noting the open pastures, as well as edge habitat where field meets forest, and forest meets stream. ‘We see Cooper’s hawks and kestrels, and lots of northern harriers. There are eagles, osprey, and red-tailed hawks, too.’"
Their stewardship is active and ongoing. One of their choices has been to enroll in a landowner conservation incentive program. Pete described the work this way in his article for Drops of Water: “Margaret and I also chose to add to the conservation values of the farm by participating in the Conservation Reserve Enhancement Program (CREP). 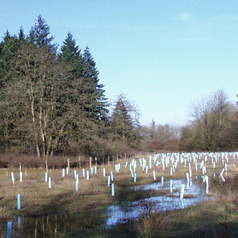 This has been arranged through the Thurston Conservation District. Margaret jokingly noted to the Capitol Land Trust News that, “Grandpa must be spinning in his grave to see us planting all these trees” because clearing the pasture of stumps had been hard labor. Besides the planting, Keith, Margaret, and Pete controlled weeds and hand-watered the native tree seedlings. For their stellar efforts, the Thurston Conservation District named them Wildlife Stewards of the Year in 2005. As in many rural parts of the Puget Trough ecoregion, southwestern Thurston County is increasingly seeing working farmlands change to primarily residential use. Pete and Margaret decided to take action to maintain the farm for conservation and open space. Pete wrote about their decision in Drops of Water: “We learned about a strategy called a conservation easement, and it caught our interest. This would provide a way to pass on the farm to our heirs, yet preserve its natural beauty and role in protecting the Black River forever. “With a conservation easement (a legal agreement accomplished with the help of a land trust) we can decide exactly what activities will be allowed on our land in the future. It can be designed any way we want. Our children will still inherit the property, but development that might harm the farm's conservation values would not be permitted. “This way we protect for posterity the same land that our parents and grandparents protected for our use and enjoyment. A conservation easement also protects the welfare if not the actual survival of the muskrat, beaver, mink, and otter, who, along with many other creatures, have lived on our land and in the river for as long as we can remember. “We will allow farming, grazing, and light recreational use (such as horseback riding), but not heavy residential or industrial development of any kind. I love my grandson, but I don't want him to build a dirt bike track on the property. Besides their work with the Capitol Land Trust, Pete, Margaret, and Keith are members of the Chehalis River Basin Land Trust, and Pete serves on its board. 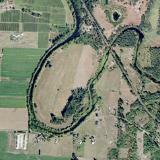 The Black River is a tributary of the Chehalis. Pete commented in Drops of Water that “Thousands more acres need to be protected to preserve native plants and wildlife and their habitat. A conservation easement is one way to protect the land. Holding a conservation easement is not a passive event. It requires legal services, scientific monitoring, and a strong organization to educate the community about conservation options for landowners. Margaret, Keith, and Pete are also active with the Chehalis River Council, which works to protect the resources of the Chehalis River Basin. They are looking ahead, to help conserve the biodiversity of Thurston County and the Chehalis River Basin for their children and grandchildren. Drops of Water is edited and produced by the Chehalis River Council. It is a newsletter insert published every other month in the Aberdeen Daily World, the Centralia Chronicle, and The Olympian. Pete's article appeared in the August, 2003 issue. Capitol Land Trust News is the newsletter of the Capitol Land Trust. Shelley Kirk Rudeen's article on the Holm Farm appeared in the Winter 2005 issue.